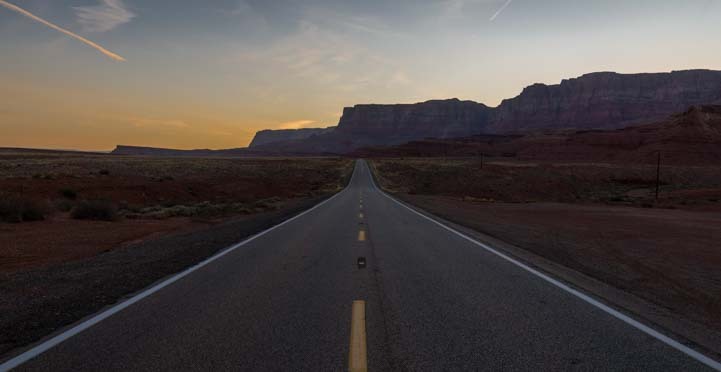 March 2016 – Arizona boasts lots of incredibly scenic drives, and one beauty is Routes 89 and 89A which double back on themselves between Page and Lees Ferry in the northeast corner of the state. 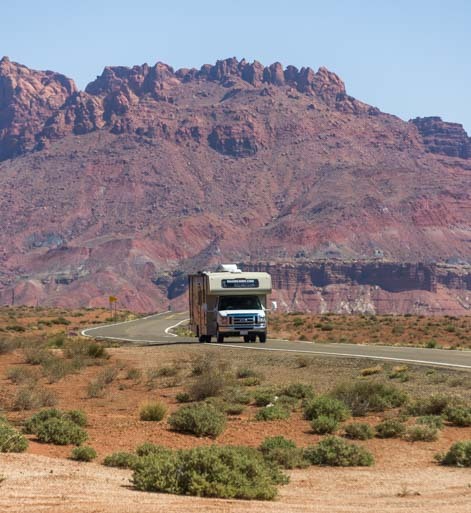 This is a portion of the Vermillion Cliffs Scenic Byway, an area that is great for RV travel. 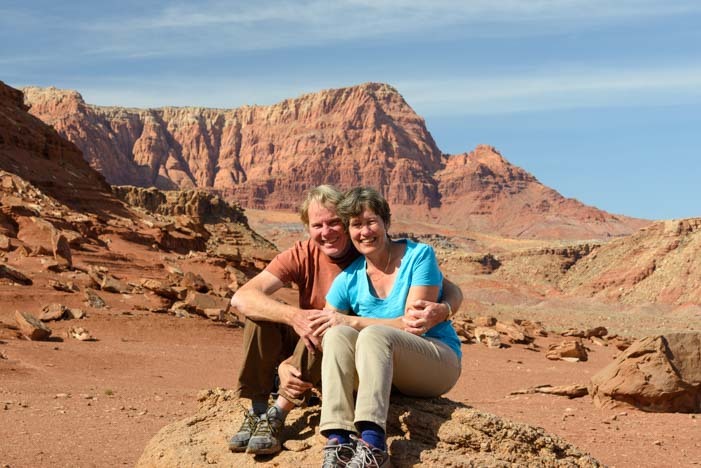 After our wonderful visit to the Horseshoe Bend overlook in Page, we drove to Marble Canyon and Lees Ferry. 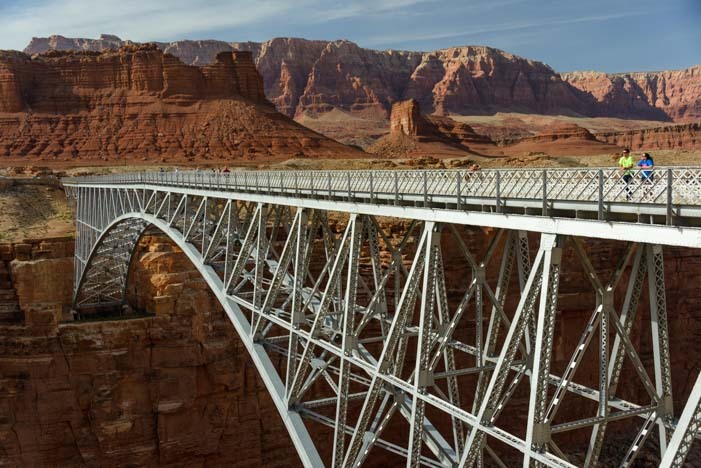 At Marble Canyon, the Navajo Bridge spans the Colorado River. It was built in 1929 and was an important bridge because it made it possible to cross the moody Colorado River without taking the more antiquated cable ferry across at nearby Lees Ferry. Cars were new in those days, and the ferry system wasn’t great for carrying cars across the river. 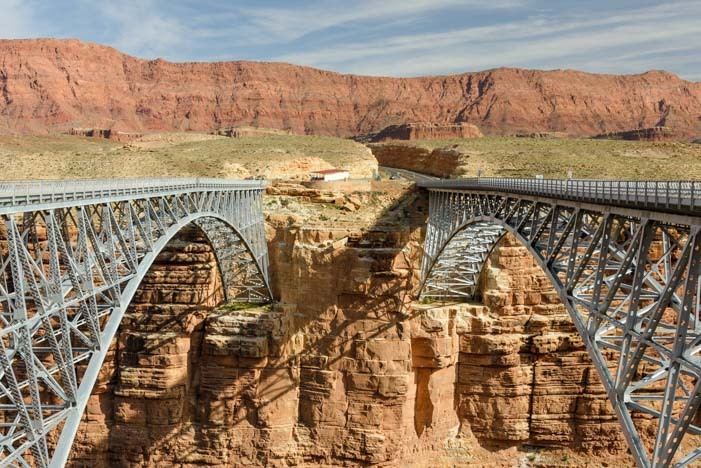 In 1928 the ferry sank, killing three men, so the bridge, known then as the Grand Canyon Bridge, was a huge improvement. Today the original bridge is a walking bridge that runs parallel to the newer highway bridge that was opened in 1997. The old Navajo Bridge (left) is now a footbridge. Highway traffic takes the bridge on the right. 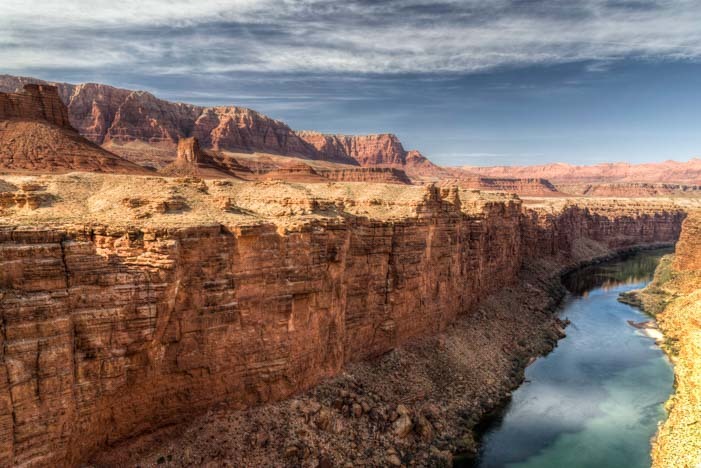 Sheer cliffs plunge down to the Colorado River on either side. We enjoyed a stroll on the walking bridge. The river is a looooong way down!! The river is way down there!! 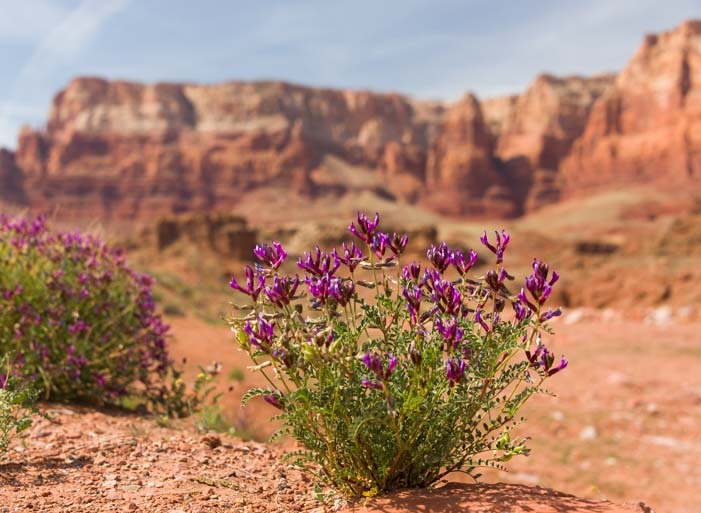 We had loved our stay in the red rock country of Sedona, Arizona, a few weeks earlier, but that little town is just the beginning of the southwest’s explosion of orange and pink color in northern Arizona and southern Utah. Spring was just beginning, and we saw bunches of tiny purple wildflowers here and there. Wildflowers were just starting to bloom. 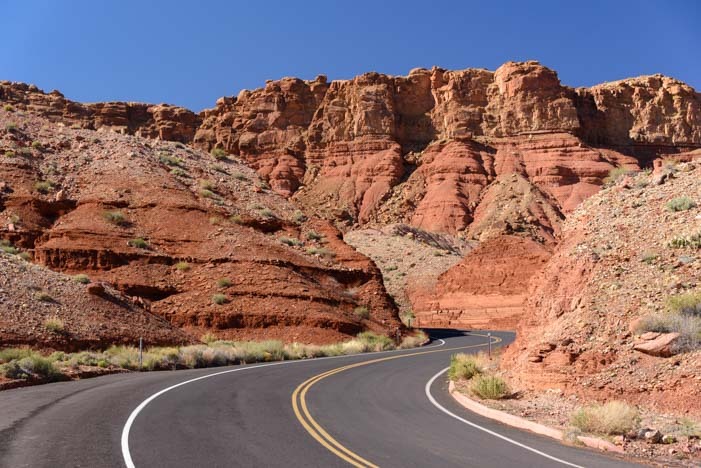 The road that winds from Marble Canyon into Lees Ferry is lined with dramatic red rock cliffs, and it is a jaw-dropper of a drive. The drive into Lees Ferry is gorgeous. The towering red walls are still eroding, and in one area there is a massive debris field of enormous boulders that have broken away from the cliffs and rolled downhill. From a distance they look like gravel, but up close these boulders are gargantuan. Boulders strewn like gravel around the cliffs are actually really massive!! We meandered among them and took a breather on a rock, totally awed by the sheer scale of Nature’s handiwork. We love red rock country! The forces of wind and water shaped these rocks, and we saw a jagged tributary leading to the Colorado River where a stream carved a zig-zag pattern through the rocks. Prior to the Navajo Bridge, Lees Ferry was home to a cable ferry that was originally built by John Lee in 1873. 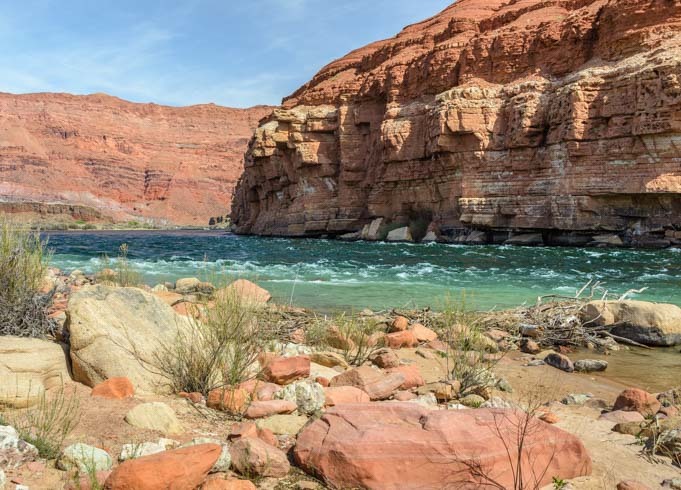 It was the only place travelers could take their horses and wagons and themselves across the tempestuous Colorado River safely. At the river’s edge there is a boat launch now, and this is a popular put-in spot for river rafters heading down the Colorado River through the Grand Canyon. Two groups of rafters were launching their rafts when we were there. One group was starting a 24 day voyage down the river and the other was starting a 16 day trip. What fun! 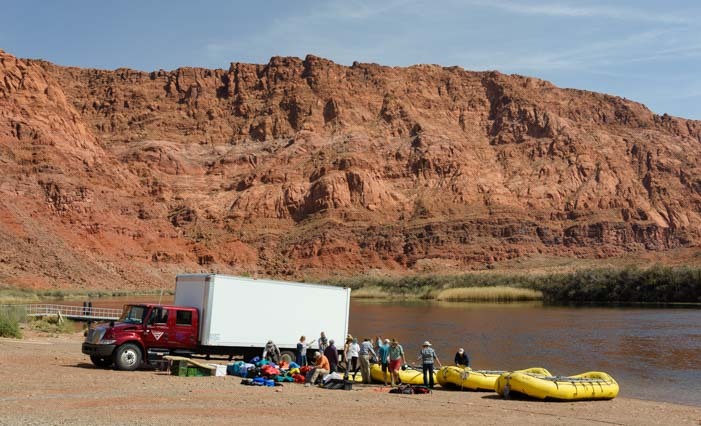 Lees Ferry is the start of the Grand Canyon, both geologically and for river rafters too. John Lee’s homestead is now owned by the National Park Service, and we roamed around a little bit. There is an orchard, and visitors can pick the apples and other fruit for free during the fall harvest. 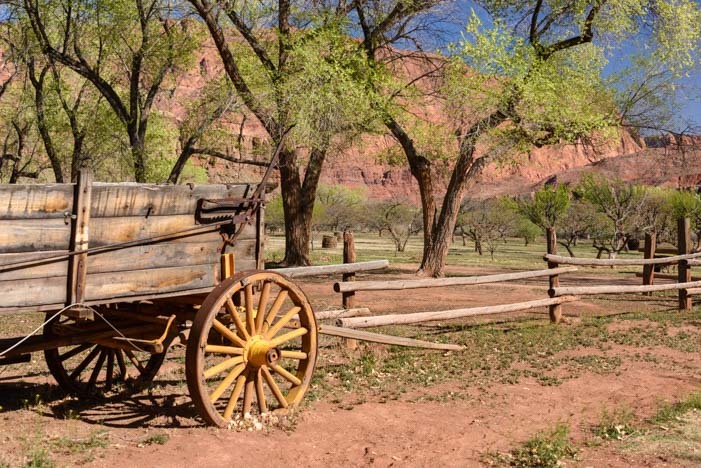 We found an old wagon sitting nearby and chatted a bit with an NPS worker who was tending the trees in the orchard. 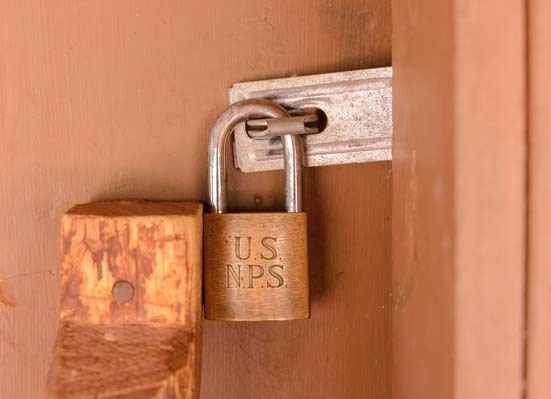 The farm house itself is off-limits to visitors, and the National Park Service has an engraved padlock keeping folks out. The last family to work the farm and live in these buildings left in the 1960’s when the National Park Service bought the property. We wandered out beyond the farmhouse along the dirt road that passes the old farm fields, and we found an old Chevy dually truck sitting out there. As I looked at it, I couldn’t help but think of the day the first owner proudly put the key in the ignition and drove it home. What kind of deal had he struck with the salesman, and what did his wife think of their new wheels? The last family that lived in the homestead moved out over 50 years ago and left some things behind. 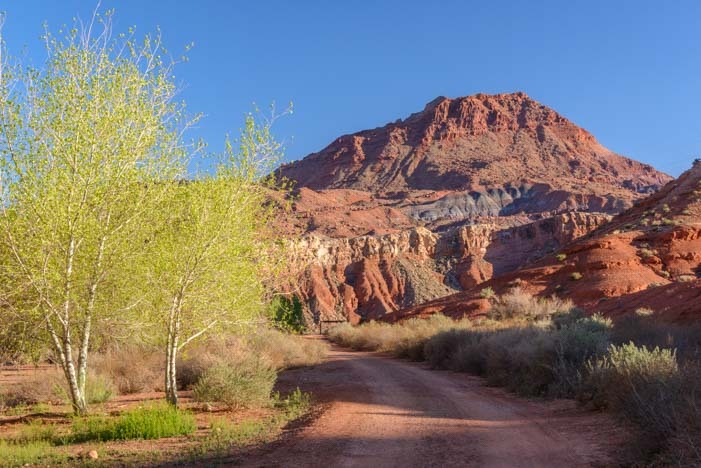 The dirt road that goes by the Lees Ferry Homestead (the homestead is called Lonely Dell Ranch) is the start of the Paria River Trail hike, and we followed the trail for a mile or so along the river. 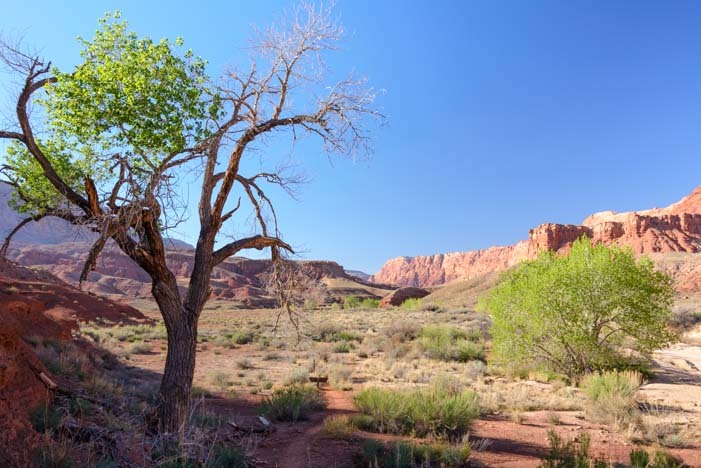 From Lonely Dell Ranch, we walked along the Paria River towards Paria Canyon. 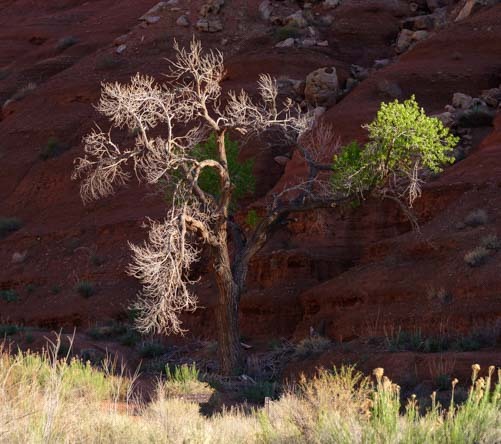 The red rock cliffs glowed a deep orange in the afternoon sun, and the cottonwood trees glowed green. What a spot! Who knew this gorgeous canyon was back here behind Lonely Dell Ranch?! There was a corral and cattle chute in a more distant farm field. I think farming and ranching would be a pretty enjoyable activity in a setting like this!! We found a corral and cattle chute out beyond the farm fields. We walked back towards the farmhouse and caught some trees shimmering in the sun. 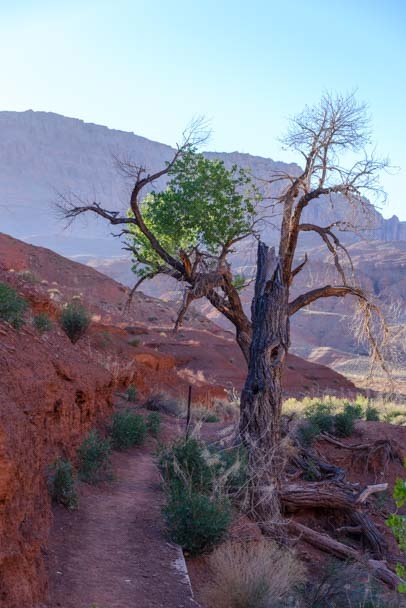 The Paria River trail at Lees Ferry is actually the end of the 40+ mile Paria Canyon trail that starts at the White House Trailhead and goes through Buckskin Gulch and the Wire Pass Slot Canyon. As we were walking, we met two hikers that were wrapping up a three day hike through Paria Canyon. They were tired and had sore feet, but they said it had been a glorious hike. 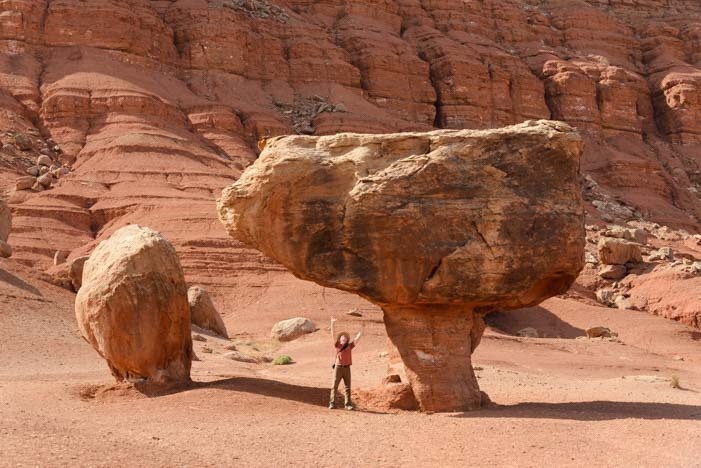 That multi-day hike is said to be one of Arizona’s best. 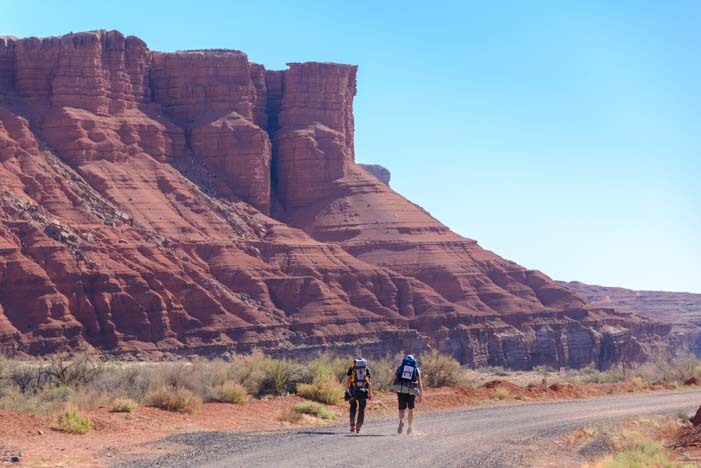 We met a pair of hikers doing the last mile of their 3 day Paria Canyon hike. Wow! We didn’t stay long at Lees Ferry, but we got a taste that will bring us back. 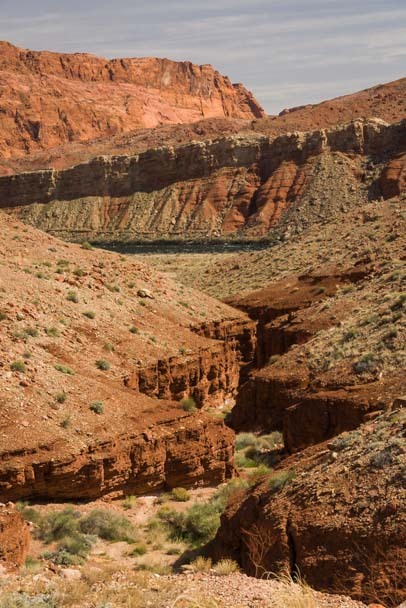 This is the edge of the Vermillion Cliffs National Monument, and the whole area is ripe for exploring. 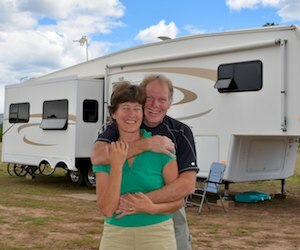 If you are taking your RV through northeastern Arizona from Page westward towards Jacob’s Lake and the North Rim of the Grand Canyon and Kanab, Utah or north towards Natural Bridges, the detour to Lees Ferry is really worthwhile. 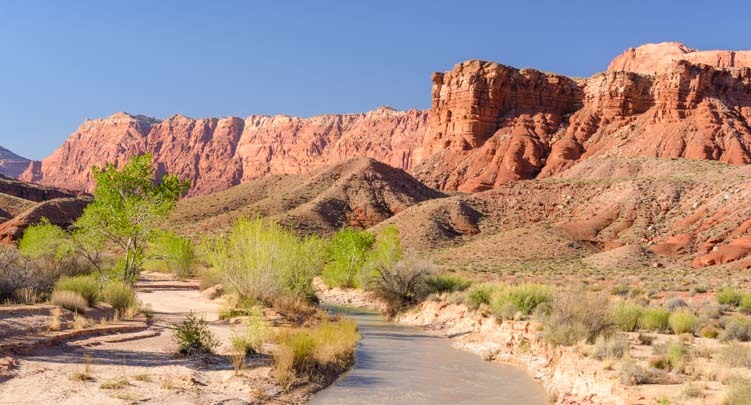 The combination of red rock canyons and riverside scenery is hard to beat! Red rock country knocks our socks off every time we visit. 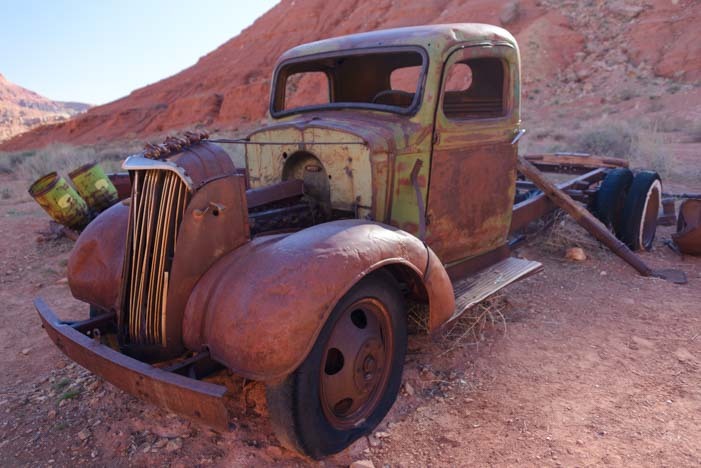 This entry was posted in Arizona and tagged Arizona, Arizona Northeast, New, Travel, USA, WP Travel by Roads Less Traveled. Bookmark the permalink. Thanks for your post on B&W Hitches. The post was very informative and well written & illustrated. With the information you provided I discovered I had a B&W turnover gooseneck installed in the 2011 Chevy 3500 HD turbo diesel I found up in Minnesota. After a few calls and a bit of additional research I got a Companion fifth wheel hitch shipped to Tucson. I’m glad you found the post about B&W hitches was helpful. And how neat to discover you already had the rails and turnover ball in your truck and all you needed was the hitch itself. Lucky you! Such a gorgeous area — and there’s so much to explore! Even though we’ve spent lots of time in Red Rock Country, we’re headed to Vermillion Cliffs National Monument for the first time in May. Thanks for the wonderful preview! You’ll have lots of fun there, Laurel. Enjoy!! We took a family river rafting trip that departed from Lee’s Ferry. Beautiful area! Beautiful vacation. Thanks for the memories. We would LOVE to do a river rafting trip from there. Maybe “someday”… Lucky you!!! Looking for GREAT COFFEE when you boondock? Our Melitta coffee brewer (left) and paper filters (right) make a gourmet cup without using any electricity. 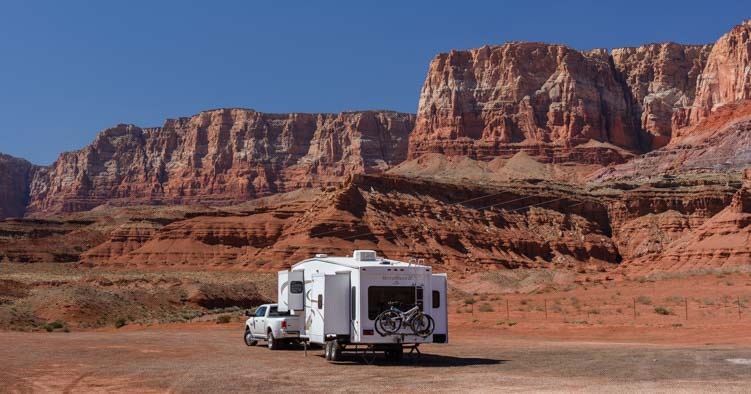 For more boondocking tips, see our page: RV Boondocking Tips.